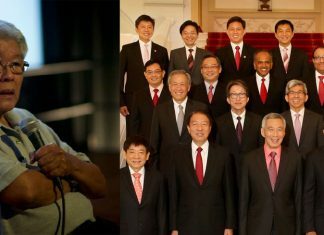 Wong Souk Yee, the assistant treasurer of Singapore Democratic Party (SDP), has appealed to the Court of Appeal for the issuance of a mandatory order compelling its three Members of Parliament (MPs) to step down. On Wednesday, January 16, after a two-hour hearing with the public gallery filled with law academics, lawyers and citizens, the five-judge apex court chose to postpone judgment. When she ran for president in August of 2017, Madam Halimah Yacob left her seat in the four-member GRC. When she won the following month, Dr. Wong filed a lawsuit asking for the by-election. According to Dr. Wong, there are contradictions between Article 49(1) of the Constitution and Article 24(2A) of the Parliamentary Elections Act. Article 49(1) requires a vacated seat to be filled, while Article 24(2A) states that by-election needs to be called only if all seats of a GRC were vacated. Peter Low, the attorney for Dr. Wong, said in court that the three other Marsiling-Yew Tee MPs should comply with both Articles, and step down. These are Alex Yam, Ong Teng Koon, and National Development Minister Lawrence Wong. Low said, “It is the MPs’ constitutional duty to call for an election. They took an oath of office saying that they would protect, preserve, defend and uphold the Constitution.” He reasoned out that because Article 49(1) mandates that a vacated seat to be filled, the other MPs must step down in order for a by-election to occur, which would fill that seat. But Chief Justice Sundaresh Menon was in disagreement with Low, calling a mandatory order “extraordinary”. He called for the law to be applied according to today’s context, saying that Article 49 had been enacted when GRCs were not around yet. Menon said, “You can’t divorce that from what the Parliament’s intentions were.” The Chief Justice was referring to the period after 1988 when the GRC scheme was introduced. Judith Prakash, another Judge of Appeal, called Low’s interpretation “even more inconsistent” with the law, which does not state that an MP should step down because of a vacated seat. In April of 2018, the lawsuit had been dismissed by the High Court, since the court reasoned that there is no basis in the law that calls for remaining MPs to give up their seats. According to the High Court, a by-election should only be called for a whole GRC team when every seat becomes vacant mid-term. However, Low alleged in Apex court yesterday that voters are shortchanged when a GRC has one missing MP because the vacancy could “compromise” the right to representation, since MPs are only given a maximum of five questions in a parliamentary session. And Justice Phang asserted that the underlying principle behind Article 49(1) is actually representation. Therefore, when there is a vacated seat in a single-member constituency, this necessitates a by-election, so as to avoid that citizens being unrepresented.